This entry was posted in "Four legs good", Favorite Perfumes, Single Note Exploration and tagged Atelier Cologne, Bee's Bliss, Fragonard, Frederic Malle, Givenchy, Harvest 2007 Amarige Mimosa, Infusion de Mimosa, Jo Malone, Mimosa & Cardamom, Mimosa Indigo, Prada, Sonoma Scent Studio, Une Fleur de Cassie. Bookmark the permalink. I think my favourite is Champs Elysee EDT. 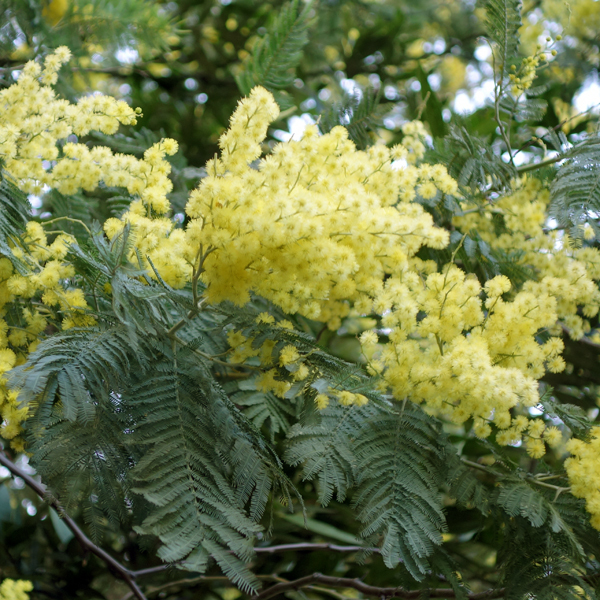 That waxy, mellowed mimosa plays into my image of the wattle trees in my backyard. I went back and forth on my liking/not liking that perfume. Now I’m in the “liking” state, I think, so I’ll wear it again soon. Same! Days I adore it; days I abhor it. I haven’t tried Fragonard’s perfume, but have used their mimosa diffuser and I could swear that it was almost like having a vase of mimosa in the room. So realistic. Agree with Kate that the Champs Elysee is a good mimosa, although there is a slight ozonic note to the Guerlain that sometimes irritates me. 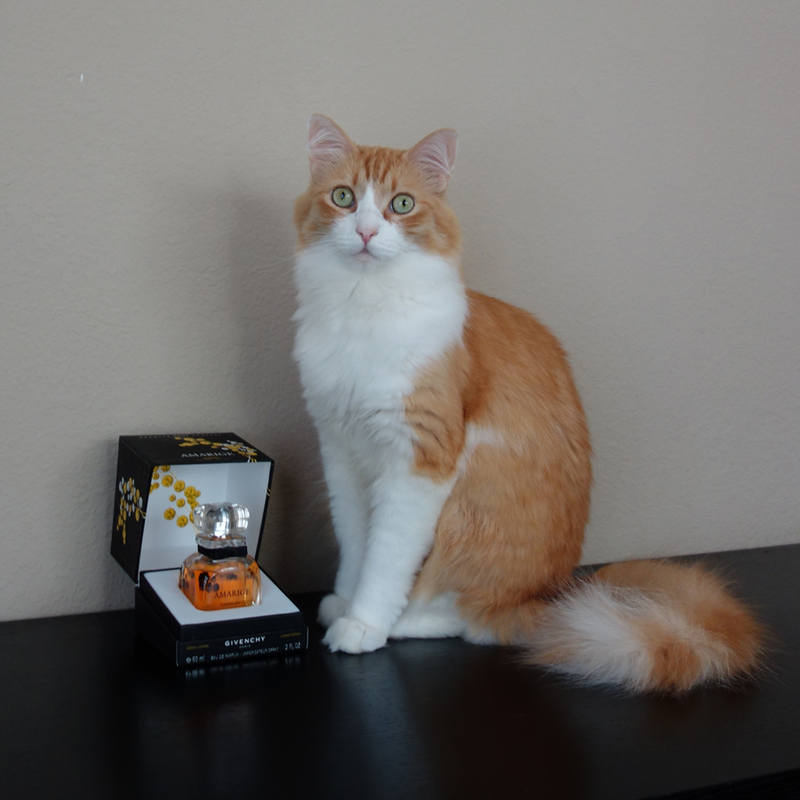 What perfume would Rusty wear if he had the choice? Something with ginger?! Fragonard’s Mimosa is almost free – if not to count the delivery costs, and I just cannot make myself pay double for an inexpensive perfume that is lovely but not earth-shattering. But if I ever come across it in my future travels, I’ll grab it. Rusty doesn’t mind most of my perfumes (as in sits on my lap and doesn’t try to “clean” me or himself with his tongue), but from time to time some of those that I test he dislikes and runs away, or starts indignantly licking himself if I pick him up while having something he dislikes on my wrists. With all the mentions of this perfume now I will definitely wear it this upcoming week. I love Bees Bliss and wish I had bought a full bottle. In fact I wish I had bought a full bottle of Laurie’s entire line. I saw the title of your post on my phone this morning and decided to go with a sample of Czech and Speak Mimosa…and thunk for the sample…. And way off topic but have you ever tried Ava Luxe Perfumes Milk? My girlfriend just sent me a sample and it reminds me very much of Jo Malone’s Sweet Milk. You and I are both fans of that one so I thought I would share this with you. Thank you for the information! I’ll try to get it for testing (if it’s still in production): not only I would love to have a backup for my favorite Sweet Milk, but the friend who shared Fragonard with me is also looking for that substitute. I’ve never tried anything from that brand – just never saw it at a store but wasn’t compelled to pay for samples. I still owe you a package with a couple of my SSS’s “not loves” – I’ll get to it this month, promise :). Yippie!!!! yes!!! Please send unloved SSS :) Thank you!!!!! Ava Luxe Milk is still in production…I thunked the Sweet Milk sample you gave me years ago already so I can’t compare but AL Milk does smell as I remember Sweet Milk to smell. If you can’t get your nose on it I will put the sample to the side and send it out to you in the Fall when the weather is cooler….unless you want it now? Just like you and partially thanks to you I love mimosa now as well. Mimosa & Cardamom is just lovely and I wouldn’t mind a bottle of mimosa from Prada. I also remember liking Brosseau Thé Poudree. I shall give Givenchy mimosa a try this upcoming week. Thank you, Lucas! I got some needed rest this weekend, so it was (still is) good. Perfume that you’ve mentioned I also liked (thank you for the sample), and probably could buy and wear… it would be a tie between it, Fragonard and Prada’s one. Oh, and I wanted to mention that I’m still enjoying your last year gift (I have too many gels open at the same time, so same as with perfumes, I do not finish any of them quickly :) ). I have the smaller bottle of Bees Bliss and wish I had bought the largest one when I could. Mimosa is not well represented in my collection, although I have a mini of Champs Elysses that I will need to pull out and sniff. Had I known I wouldn’t be able to replenish it, I would have gone for at least a 17 ml bottle (for the fear of the larger one spoiling). There are many mimosa offerings out there (you can check those previous posts if you want some ideas), and mimosa works nicely in spring. Linden is probably my most favorite of all tree blossoms, so I wear perfumes with it a lot too. But where I grew up, these two had a couple of months in between their respective blooming seasons, so the only time I have them combined is in perfume form, and Champs Elysees is the first one that comes to mind. I own but haven’t worn Zeta in a while. I should remedy that. Ah, I always think of you at the mention of Mimosa & Cardamom, as you supplied me with a decant a few years ago. The commenters above have reminded me that I have a mini of Champs Elysees somewhere, possibly even two. I know I didn’t love it way back when (though I can’t remember the reason), but am most curious to give it another whirl now. I had no idea it had mimosa in it. I used to love Mimosa et Moi too – very true to the note. Mimosa as a flower I associate with the Mardi Gras procession in Nice, from when I lived near there as a student. The branches provided a welcome splash of brightness after the grey days of winter. And Rusty really does look surprised!! You already saw my story of liking/loving/hating Champs Elysees, Now I’m back to liking it, so I’ll wear it probably this week. Mimosa is so cheerful! But even though we have a couple of varietals of it around here, it’s not customary to use it for decorative purposes, so I never see it sold at a store. Rusty really does look surprised in that photo! I hope he’s doing well. Rusty if fine, I’ll be posting some bits and pieces about him soon. If you come across that Fragonard somewhere without doubling its price by S&H, please alert me too. In North Africa, Morocco, Rif Mountains, the Berbers bring Narcissus and Mimosa in clumps to the market for sale–this happens in late November and early December. Now that is an early spring. Sorry I’m so late to the party. Mimosa pour Moi was in my collection for a while but I so rarely got it out to wear I moved it on. Champs Elysees gets quite a bit of skin time around here though, another that moved on was the Aqua Allegoria Tiare Mimosa. Maybe I’m not a mimosa maniac. How freaking cute is Rusty? Hi dear! You’re never late! I’m glad to see you (and to show what “late” means – I still plan to answer your last Saturday’s question ;) ). Mimosas are so cute, but for me spring is “lilac”! Which is why I have an obsession with them in perfume. I do love lilacs (and plan to see if I could do a week of lilacs soon ;) ), but mimosa is/was the first flower of our cold spring in my childhood, lilacs would come later. I think that Champs Elysees is one of those rare perfumes that smell quite similar in all concentrations (well, at least they used to 6-7 years ago, since I haven’t tried the newest incarnations). I don’t know what real mimosa smells like (light and sweet with a little bite?). If this is what mimosa smells like, then Prada Mimosa would be my favorite. I also have the Elizabeth Arden Green Tea Mimosa which I also like and will wear more of in the summer! And Rusty looks regal in the picture! Both Prada and EA (which I also have – thank you! – and plan to wear) smell close to how mimosa smells. Fragonard or Calypso smell even more like the plant (in case you come across them and can test), but they both are less interesting as perfumes than Prada or EA. These choices all sound lovely, Undina. I definitely need to explore mimosa fragrances some more.